Team Orica GreenEdge won the Team Time Trial today in Nice, France, delivering their rider Australian Simon Gerrans to the Yellow Jersey. starting gate at today’s Team Time Trial. Australian Simon Gerrans won the Yellow Jersey when his team Orica GreenEdge bested the leading time set early on by Team Omega Pharma Quickstep by an amazing .75 of a second. For a while it looked like the Yellow might go to best young rider, Pole Michal Kwiatkowski of the Omega Pharma Quickstep team when they set the time to beat early on in the stage. He’ll still don the White Jersey today. Team RadioShack Jan Bakelants was unable to keep the Yellow Jersey when his team set a disappointing time of 26 minutes 25 seconds, more than a minute off the winning time for Orica GreenEdge at 25 minutes 56 seconds. Omega Pharma Quicktep set the initial record to beat and held off all competitors until Orica GreenEdge passed the finish line .75 of a second faster. The 25 km stage was a team time trial that started and finished in Nice. Teams raced away from the Avenue de Suede at four-minute intervals and the finish was on the famous Promenade des Anglais. At first team time trial champions Omega Pharma Quickstep set the time to beat at 25 minutes 57 seconds. That was the opening salvo that hung in the air as team after team could not best the time of Omega Pharma Quickstep. Hopes were high for the Garmin Sharpe team who won the Team Time Trial at the 2011 Tour, thanks to the muscle of Scotsman Dave Millar who was British national time trailing champion in 2007, as well as Belgian Christian Vande Velde, who has had a number of time trial wins under belt as well. Despite the fact that Team Manager Jonathan Vaughters has led an international effort to eliminate performance enhancing drugs in cycling, both Garmin Sharpe cyclists have faced public mea culpas in the past for using performance enhancers. The team’s inability to beat the best times could be in part testament to it’s continued promise to ride clean. At the intermediate time check, Garmin Sharpe was 4 seconds slower than the Belgian team Omega Pharma Quickstep. If they would have won the team time trial, David Millar would have donned the Yellow Jersey because he was one second back from Bakelants in the overall standings. Team Sky looked to better the best time so far by Omega Pharma Quickstep, but they fell short. Teammate Thomas Geraint was suffering from a fracture in his pelvis. Cannondale, who have enjoyed so much success with their sprinter Peter Sagan were unable to best that number. Even after Team Cofidis, Cannondale, and Francais des Jeux had arrived at the finish line, Team Omega Pharma Quickstep still held the best time. Then Katusha came in and beat Cannondale’s time. Sadly, Garmin Sharpe was not able to best the time of Omega Pharma Quickstep, and five hundredths of a second off the time of Lotto-Belisol, narrowly missing the opportunity to put Millar in the Yellow Jersey. With the advantage of seeing the time achieved by Team Garmin Sharpe, Team Saxo-Tinkoff took off, with Alberto Contador riding, who is one of the fastest time trialers –at least prior to the doping discoveries and suspensions of 2010. Team Sky was able to improve the time over Garmin Sharpe, but could not best the leaders so far of Omega Pharma Quickstep, and were only 2 seconds back, establishing at least for the time being, second place. Though Sky won the TTT at the 2013 Giro d’Italia, wunder boy Geraint Thomas was suffering from a cracked pelvis he sustained in a crash in the first stage in Corsica. Team Saxo-Tinkoff at the start of stage 4 in Nice, France. 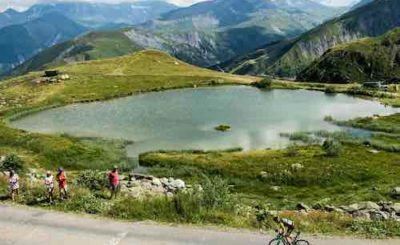 With the likes of Alberto Contador, could they make the best time? The team fell short. Contador’s Saxo-Tinkoff was still on the course ready to prove their mettle. At the halfway point they were only one second behind the best time set by Omega Pharma Quickstep. Many of you may recall how Contador shaved one minute and 30 seconds off the best time posted by Lance Armstrong in the 2009 Tour individual time trial in Annecy. 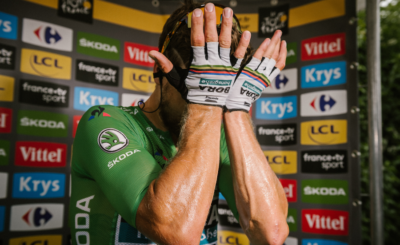 Sadly both those times have since been tainted by dope findings and confessions, though neither rider has admitted to doping on specific racing days–in particular that day in Annecy. Let’s just say this: as much as Armstrong’s time was fast, Contador’s was beyond fast. 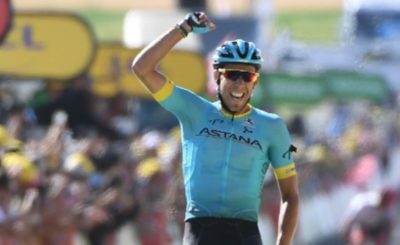 Still you can’t discount ability, as Contador has shown himself again and again to be capable of excelling both on the straights and in the mountains. At the time that Saxo-Tinkoff was still on the course, Team BMC of Cadel Evans, 2012 Tour winner took off. Also if you remember, Evans consolidated his Yellow Jersey in the final time trial in Grenoble in 2011. Could it be a draw between the two teams? Team BMC has one of the fastest riders, 2011 Tour winner Cadel Evans. But the team came in a disappointing 9th at 26 minutes 22 seconds. Then Saxo Tinkoff came in and were unable to better the Omega Pharma Quickstep, at 26:05, giving them third place, and now unable to put the Yellow Jersey on their rider Nicholas Roche. Then Simon Gerrans’ team–remember the Australian won the sprint yesterday, and his team Orica-GreenEdge bus ran into the finish line banner in stage 1– took off with high hopes to reverse a 3 second deficit to the Yellow Jersey. When they came to the finish line, they bettered the Omega Pharma time by .75 of a second–25 minutes 56 seconds, delivering Gerrans at least for the time being, to first place. Team RadioShack Leopard Trek would be last with Yellow Jersey leader Jan Bakelants in the mix. They would have to beat the Omega Pharma Quickstep time to keep the winner’s jersey. With the legs of eight time time-trial champion Fabian Cancellara, Andy Schleck (who was third after Contador and Armstrong in Annecy in 2009,) Jens Voigt, Andreas Kloden, and Haimar Zubeldia, they could possibly deliver. Team BMC was still on the course, with riders Tejay van Garderen and Cadel Evans keeping up the pace, but they were unable to beat the leaders, and came in 26 seconds behind the new leaders, Orica GreenEdge. The last team on the course was Team RadioShack, and 2 minutes before the finish, they were behind Orica GreenEdge. The best time was 25 minutes 56 seconds, and the writing was on the wall. No win for Bakelants. A new winner was declared, holding his little child for the cameras. At Cyclists International, we bring you the news quickly, fairly and without bias, and without advertising. Please show your support, and donate today!